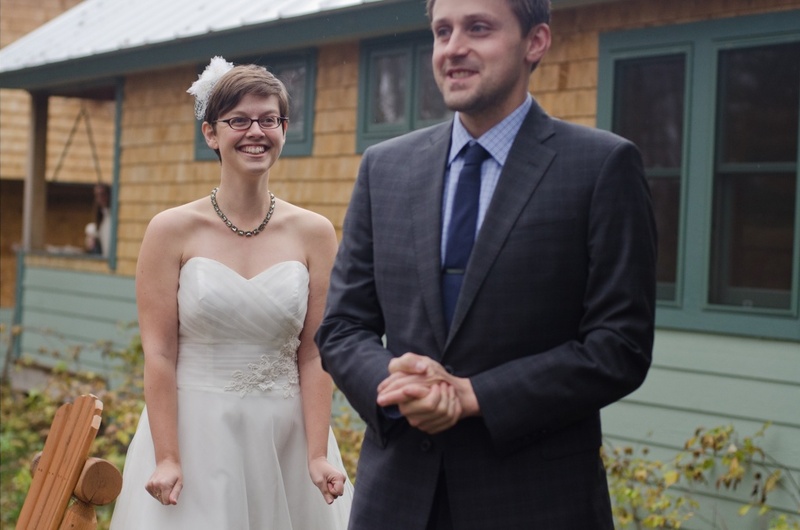 In case all the posts referring to wedding stress haven’t tipped you off, I got married! On November 1. In Maine. In a strapless, tea-length dress. Did I mention the wedding was in November? In Maine? 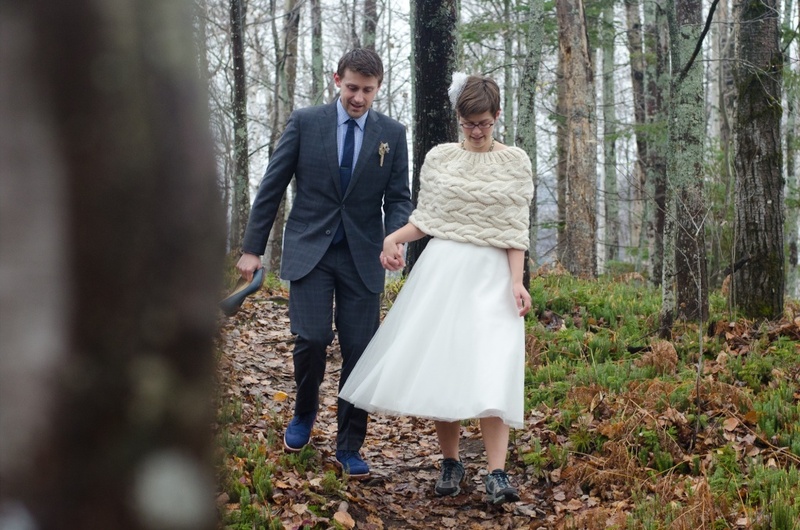 I realized pretty quickly after I bought my dress that bare shoulders weren’t going to cut it, and I started knitting Jami Brynildson’s Braided Cable Hug in a soft, fuzzy blend of ivory yarns to wear over the dress in case I got cold. With RS facing, graft the ends together using a darning needle, taking special care to match up cables and maintain a neat RS fabric. Furious Googling and Ravelry forum combing for “seam together cables” and “sew cables together knitting” revealed that a) the correct term is “grafting”; b) in order to do so, I should have used something called a “provisional cast on” (whoops); and c) grafting together cables is apparently WAY HARD. Also, contrary to the pattern instructions, one should block before grafting, rather than after. 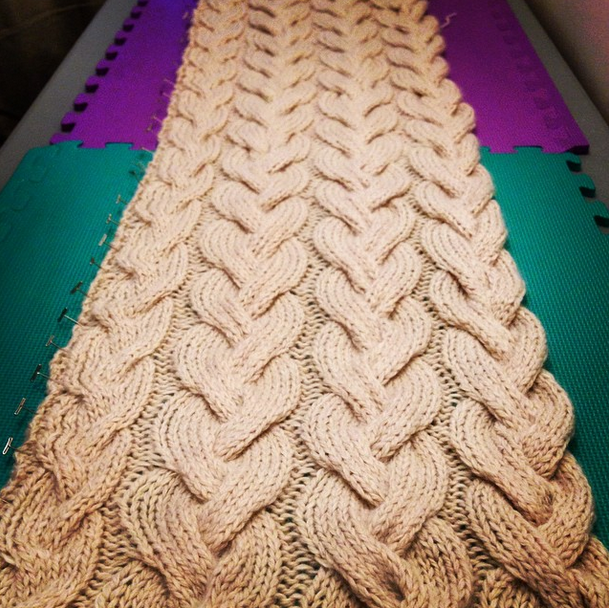 So: I blocked it on my new fancy foam blocking mat and hoped for the best. Between researching cable seaming and blocking, I also moved, and by the time I got back around to the project, I had kind of given up on “maintain[ing] a neat RS fabric.” Sorry, Jami Brynildson. Instead, I seamed the two edges together in an extremely obvious line and decided I’d wear that part at the back. Done. 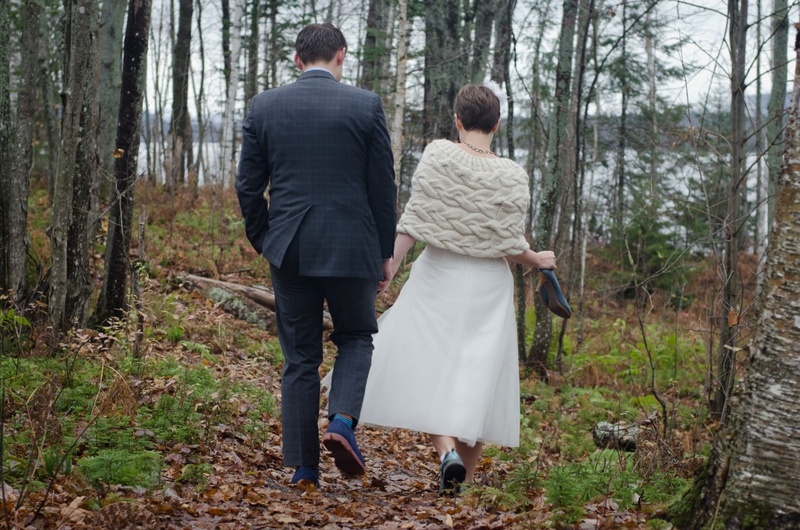 After I looked at the pictures, I kind of regretted adding an extra half row of cable—the pattern as written includes three rows of 12-stitch cable, and I added a 6-stitch cable row at the top to mimic a photograph I’d seen on a wedding site. I like the way this looks, but the cover-up ended up coming down below my elbows, which gave the whole ensemble a bit of an awkward penguin look. The piece was big enough that I could move my arms freely, but I think it would have looked more elegant if it had ended just above my elbows. Now that the wedding’s over, I’m not sure when I’ll wear this again—the length makes it a bit too cumbersome for daily wear, and the style isn’t quite office appropriate for me. That said, it’s so soft and cuddly that I can see myself tossing it on over leggings and long tee for lazy winter days at home. Readers, such as you are (is anyone still out there? )—have any of you ever tried this so-called “provisional cast on”? Have you ever grafted cables together? Any pointers?